When Westworld *finally* returns next month, the revolt will be in full swing, and Dolores and the rest of the hosts will be out for serious revenge. 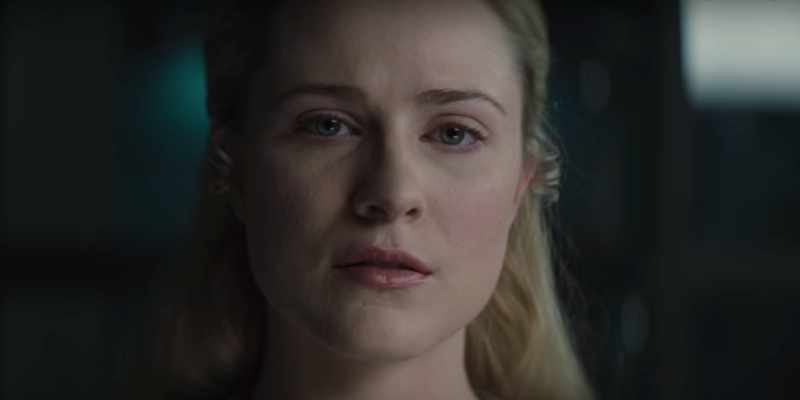 Set to a haunting cover of Nirvana’s “Heart-Shaped Box” — courtesy of Ramin Djawadi — an explosive full trailer for the highly-anticipated second season of Westworld has arrived. And like the Westworld Super Bowl teaser trailer promised, we’re in for another wild, jaw-dropping season. The trailer opens with Dolores and Bernard analyzing his dream, which sees the former programmer still in league with Westworld security guard Ashley Stubbs and Charlotte Hale, who are trying to quell the rebellion. While Bernard, who spent most of his life unaware that he was actually a host, tries to pass the dream off as nothing, Dolores isn’t quite convinced — making it clear Bernard’s true loyalties will be tested in the coming season. Elsewhere, Maeve is still on the hunt for her missing daughter, and it appears nothing, including Lee Sizemore admitting that her daughter was “never real” and has already been reprogrammed, will keep the host from reuniting with her. Additionally, the season will delve further into William’s journey to becoming the ruthless Man in Black via flashbacks and explore the expanded universe of Westworld, including Shogun World, which was teased at the end of the first season. Westworld returns for its second season on April 22nd on HBO — but we can’t wait another minute! !